OSWEGO — About 530 students are eligible to participate in SUNY Oswego’s December Commencement at 10 a.m. Dec. 14, then take steps to futures that include jobs and graduate school — with some expecting a new bonus. Around 40 undergraduates are eligible for the new Graduation Return on Investment — a $300 financial incentive for those enrolling in a fall semester and graduating no later than the end of their fourth consecutive academic year. Master’s of graphic design candidate Jeffrey Newell, shown talking to a class about his award-winning film “Photosphere,” is among around 530 SUNY Oswego students who will take forward hands-on lessons and degrees after December Commencement on Dec. 14. Michael Pittavino will keep working part-time in local public history while actively continuing his search for a full-time job, but his Oswego experiences should open eyes of potential employers. The master’s in history candidate completed a Festa Fellowship last summer at the State Department’s U.S. Diplomacy Center in Washington, D.C.
During the summer’s free time, he researched classified and unclassified Cold War documents in national archives, thanks to a pair of campus research grants, and later shared what he learned on the collection, analysis and evaluation in those archives through seminars and courses at SUNY Oswego. He said Oswego professors, especially Gwen Kay in history, helped him find research funds and grow as a young historian. 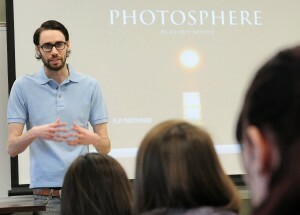 Jeffrey Newell completes his master’s in graphic design as an award-winning and in-demand student filmmaker. With bachelor’s degrees in broadcasting and cinema and screen studies from Oswego already, he plans to teach film and photography at a college level while continuing to freelance as a cinematographer, photographer and designer. Human development major Alyssa O’Bryan carries what she’s learned into a job with Liberty Resources as a youth specialist serving kids with intellectual disabilities. She also plans to attend Syracuse University in fall 2014 to pursue her master’s in social work. Spencer Hill and Sherade McKitty take forward lessons from Oswego’s Teacher Opportunity Corps/Teacher Recruitment for Urban Schools Today initiative, which supports students of color wanting to work in inner-city schools and serve as role models. “Students that live in those inner cities can see business professionals that look like them and can strive to achieve more than what they see in their own neighborhoods,” Hill said. Earning a childhood education degree with a social studies concentration, Hill plans to seek a master’s in special education or literacy. McKitty, a double major in adolescence education with an English concentration as well as in English, said she next will seek a master’s in literacy education, with Oswego her top potential choice given her positive undergraduate years.